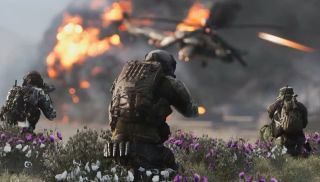 "Through my eyes, I will show you war," claims this first video in a fan-made series of Battlefield 4 shorts. What it should really say is, "through a position just behind and above my right shoulder, I will show you war," the action of the piece taking place entirely in third person. And while it may not have Kevin Spacey delivering a bitter polemic , it's still a nice reminder that DICE's shooter can be a dramatic and beautiful thing. When it works. The video was created by YouTube channel The Two Scotsmen, and is the first in a planned series of shorts. It shows our protagonist soldier running through a variety of the game's multiplayer maps—all while helicopters, tanks and people explode. It's an incredibly stylised representation of the game. For one thing, there's nobody in map-chat calling everybody involved a noob.